Businessolver Inc., founded in Des Moines in 1998, operates an online benefits administration technology platform for U.S. and Canadian companies. In 2010, Businessolver moved its rapidly expanding business into the third floor of the 1970’s Ashworth Tower in West Des Moines, IA. Ashworth Tower (91,800 sf on five floors) was a typical office tower of the times with a central elevator/mechanical/restroom core, surrounded by a rated corridor with the remainder divided into suites subdivided into private offices, conference, etc. 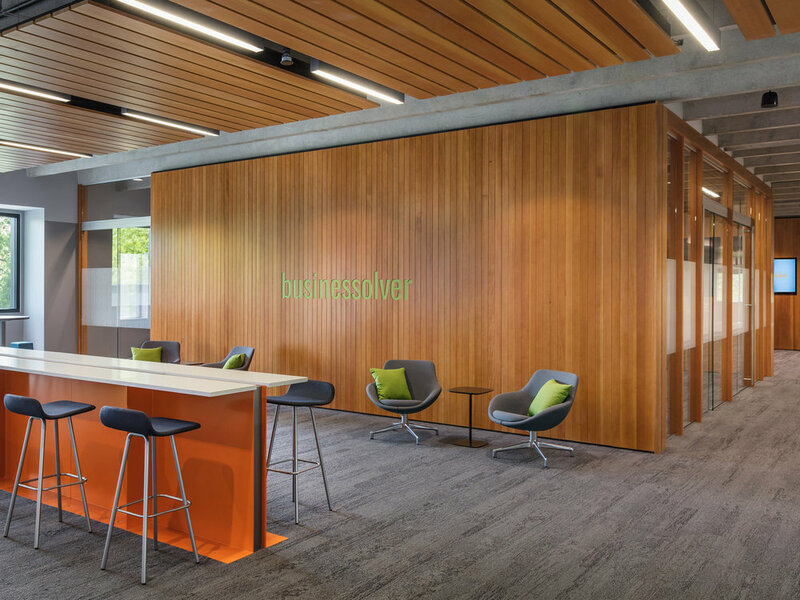 Businessolver expanded onto other floors as their business expanded. As of 2016, Businessolver became the only tenant in the building. Phase 1 and 2 removed all interior walls/ceilings except core spaces and main mechanical feeds. The building core was extended to include IT closets, storage, kitchen, common/break-out areas. Enclosed spaces (private office, team/war rooms) were placed on the west and east sides while large conference spaces were placed centrally on the floor. 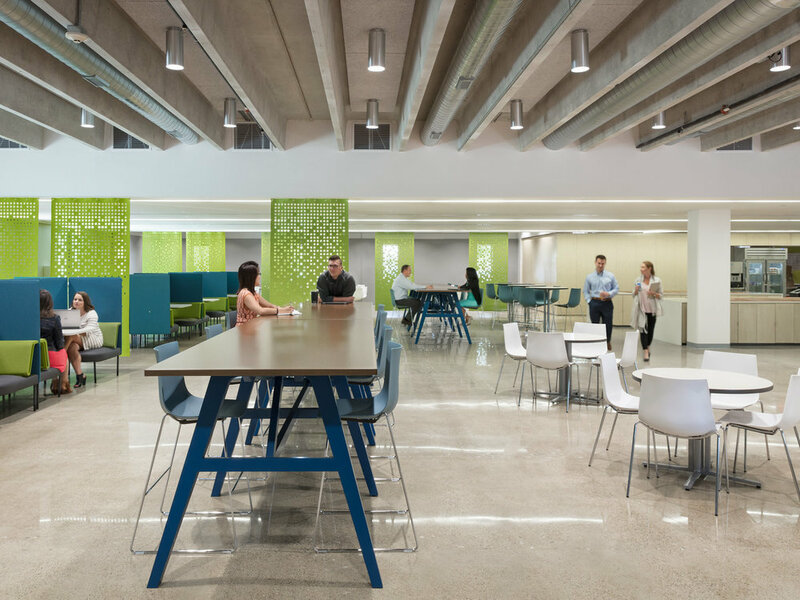 The remaining space on each floor created four separate reconfigurable open office spaces that allowed for defined spaces for different departments (sales, marketing, IT, etc.). Phase 3 removed all interior walls/ceilings except core spaces. Level 1 includes separate entrances for client’s at the south and employee’s at the north. Level 1, west includes a common break/dining area with a full kitchen/bar for private events and on the east, a fitness/locker area. On the remainder of Level 1, east and all of Level 2, east is client services; client services is the main contact for client’s employee’s with Businessolver and therefore important for client’s to visually see yet not physically interact with. On Level 1 and 2, client services is adjacent to the client entrance and hospitality spaces. Level 2, west includes hospitality, conference and client restrooms. In the final phase of the project, a portion of the exterior south wall was removed for a new client entrance. The parking lot was altered to include a turnaround and a cantilevered canopy was added at the south that allows visitors to drive under for drop-off. A smaller scale canopy was added at the north for the employee entrance. In addition to the steel canopies, the first two levels of the façade were reclad in steel and backlit perforated-corten to break up the monotonous rhythm of the existing façade and to contrast materials with the heavy brick and precast façade. The façade reclad also provides a delineation of program on the façade; Level 1 & 2 client function and Level 3 + basic office functions.